Make sure you are aware of the rules specific to the course you are playing before teeing off. If you use a cart on the golf course, be aware of golf cart etiquette. These rules are designed for your safety, and to protect the turf on the fairways and greens. When you pay your greens fees, find out which cart rules are in effect for the day. Rangers are on hand to make sure players follow the rules. Read the warnings posted in many golf carts about keeping safe when you use a cart., such as limiting use to two passengers, and keeping arms and legs inside of the cart. Some courses post additional cart rules. Common sense dictates that the driver should wait until the passenger is seated before accelerating. Drive carefully around the clubhouse and at intersections. Never drink and drive. Keep your cart away from tee boxes, and about 30 feet away from the greens. Signs near the green might say, “No carts beyond this point,” or arrows might point to the cart path. Do not drive close to water hazards, grassy mounds or bunkers. The water can damage the cart, and the cart can damage the mounds and bunkers. Many golf courses do not allow golf carts on the fairway of a par-3 hole. 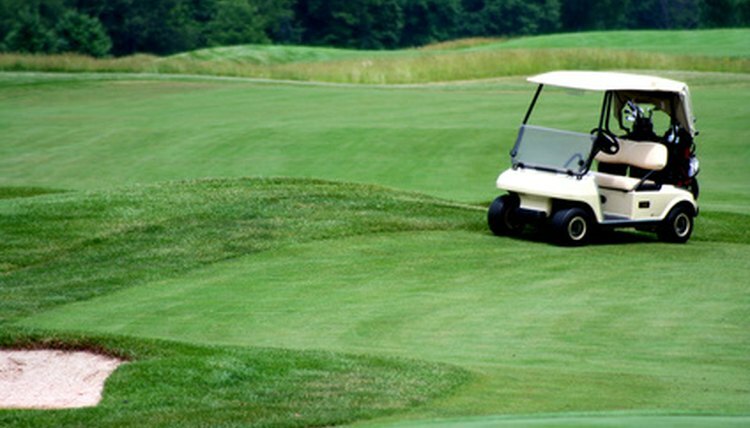 Making sharp turns, or speeding along in the cart and coming to a sudden stop, can damage the turf grass. The same goes for driving through wet or muddy areas, or grass with standing water. Keep the cart away from naturalized areas to protect the grasses and wildlife. For your safety and for the safety of your passenger, do not drive the cart in front of other players in your group or another group. As a courtesy, do not drive forward or back up when a player is addressing the ball. Players should stay on the cart path whenever possible to protect the fairway turf. On some days, especially when the course is wet, you may be asked to follow the 90-degree rule. Under this rule, carts are allowed on the fairway, but they must maintain a 90-degree angle from the cart path. You must take the cart path to a spot that is even with your ball, make a right angle turn and drive straight toward the ball. This rule may be in effect for all or some holes. On days when the golf course requires cart path only, you must keep the golf cart on the designated path and off the grass. Drive to a point where you are even with the ball, and walk to the ball. You may want to take several golf clubs with you, since you won’t be able to see the conditions near the ball from the cart. Course officials invoke this rule to protect the fairway grass, and may be in effect for all or some of the holes. As a courtesy to the group behind you, it is customary to drive the golf cart around the back of the green before putting, or at least before entering scores. This speeds play, since the next group will not be forced to wait while you clear the area.